I’m working to finish a UFO that was started…? That’s a good question. WOW! I just did a little digging and I started this quilt a little over 2 years ago. I did not realize it had been that long! I’m working on a pattern for this quilt and that was my intention all along. I Started this quilt as part of an online bee. 1 block never made it back, 1 block was very badly pieced, and 1 block has the wrong color background. So right now I have 8 blocks of the 13 I need. When I sent the instructions out for the bee I had my bee buddies doing regular patchwork to put these together. One thing I realized then (even when I made them) was how easy it was to loose your points of the tulips into the seam allowance. I realized then that this block should be paper pieced for accuracy. That is the reason it went into the UFO pile. 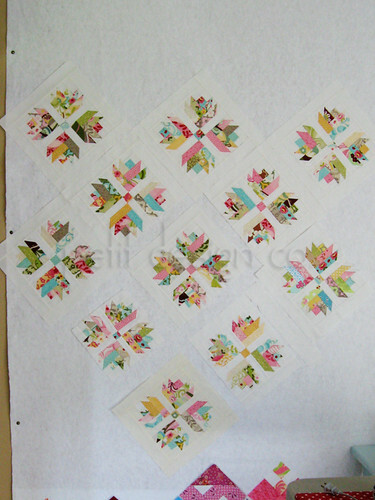 I had never done any paper piecing and I had no clue how to do it, let alone writing a paper piecing pattern! Since then I’ve scratched the tip of the paper piecing iceberg. A few days ago I pulled up my original EQ file and played around with my block until I was happy with the paper piecing pattern. So far it’s working fabulously. I hope to have the pattern ready in the next few weeks. This is going to be such a pretty quilt. I love this block! Keep at it. Thanks for linking up to my "hallway" post this month!